Nobody likes feet that ache, but you can’t even avoid it. The type of shoes we need to wear to work can really make our feet ache badly. Moreover, getting a good foot massage is pretty expensive; and today, you can seriously start avoiding your health because of the expenses. But, what if you can get an inexpensive solution that can save your time and provide you the best massage ever? Yup, there is one such solution; and it is known as the Medi-Points Foot Massager. This Medi-Points Foot Massager is not just a foot massager. As you know already, the nerve endings of all our body organs lie underneath the feet. So, the Medi-Points Foot Massager is based on the Foot Reflexology principles, which say that if your feet were massaged properly, your overall body will be revitalized. Yup, that is true, and the very reason that makes this Foot Massager so special. The Medi-Points Foot Massager massages your feet in just ten minutes. 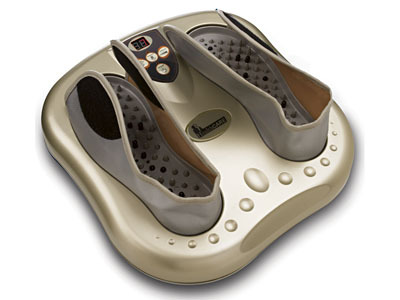 It gently massages the feet; therefore, you will feel a soothing effect in your overall body. Believe it or not, once you use it you will realize that all your stress has gone for good. It is also good for improving your blood circulation and even your backaches. You also get acupressure nodes in the package, which are quite cool. If you still are not impressed with this Medi-Points Foot Massager, then you should know that this is one product used by athletes and massaging professionals. Isn’t that cool? You are getting the power of a spa right in your house in this mini massager. The massager weighs 17.5 pounds and the overall dimensions are – 11.3 inches x 10.7 inches x 17.5 inches. It is available for <$129.95 along with the acupressure nodes. So, if you are a person who have always complained about your feet being achy, then this is the time when you can change things. Say goodbye to your aching feet and bring this Medi-Points Foot Massager home! Check out some more stuff here: The Ten Motor Massage Chair and The Magical Massage Gloves.